Eliminator™ RF Filters for DC Sputtering Power Supplies : Manitou Systems Inc. The Eliminator Filter module shown to the left includes type UHF I/O connectors. Alternate connector types are available. The enclosure size for 3 amp models is 4.5″ (114.5mm) long X 2.5″ (64mm) wide X 2.17″ (55.1mm) high. The I/O connectors will add additional length to their mounting position. The Eliminator Filter module is best mounted at the RF source however, it may be alternately mounted at the opposite end of the coaxial connection cable (typically at the power supply / controller side). Always use a high quality interconnect cable and/or adapter. Additionally, the filter module’s box can be grounded using a short, low inductance metal strip. Question: Will the use of an RF blocking filter cause losses in DC power ? Answer: All Eliminator RF blocking filters are designed for low loss and maximum throughput efficiency. This means when operated within the design specifications, the power loss through the filter is limited to the resistance of the series inductor – typically less than 1 ohm. Question: Can a long coaxial cable be used to eliminate RF energy (generated in the plasma discharge) and travels back to the DC power supply? Answer: A coaxial cable will NOT effectively keep the RF energy away from the DC supply. It is possible to use a designed cable length to place the DC supply at a “voltage node (or RF voltage minimum). Question: Where can I mount the filter module ? Answer: The Eliminator RF blocking filter is typically placed at or close to the magnetron cathode enabling the RF energy to be blocked at its source. The filter’s enclosure should be grounded to the vacuum chamber using a wide metal strap. If a strap is not used, ensure that the cathode’s power feed coax shield is grounded to the vacuum chamber. Many brands of magnetron cathodes are mounted through an O-ring sealed compression fitting (Ultra-Torr type) – sometimes the cathode’s mounting stalk is NOT well grounded and could cause RF energy leakage. 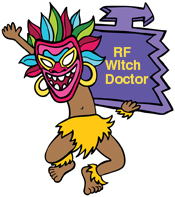 The RF Witchdoctor recommends the use of a copper or aluminum ground strap. Question: Are different filter types required for use with DC and Pulsed DC waveform generators ? Answer: Yes, there are differences in the filter circuits. Manitou offers filters that are optimized for use with specific pulsing waveforms and manufacturer’s generator products. Contact us to discuss your application. What are the available connector options ? What are the I/O connector position options ? The typical positions are at each end of the box. The filter can also be ordered with the connectors mounted on the bottom, sides and/or ends. Click here for the connector position option page.